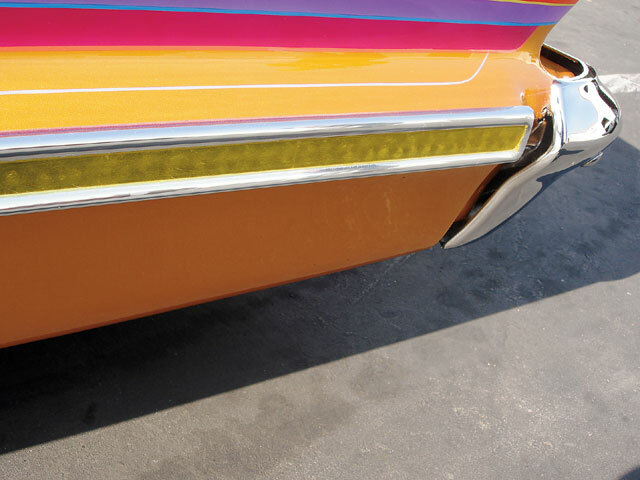 Installing the "Sound of Lowrider". 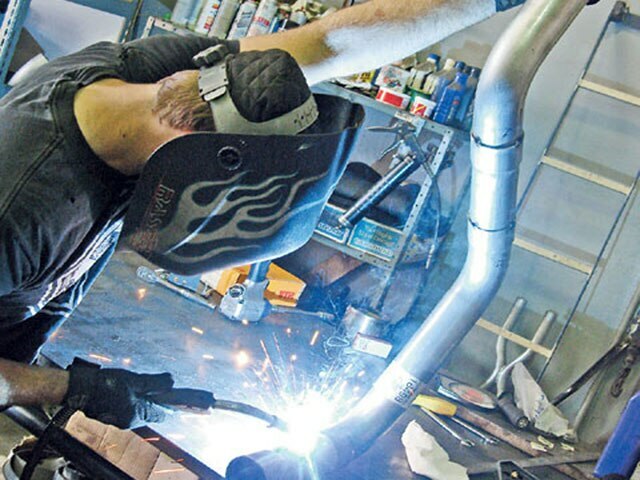 Aftermarket exhaust kits and mufflers have been developed for several reasons. Most of the performance guys will add these kits to their vehicles to gain horsepower, usually adding 5-15 additional horses. 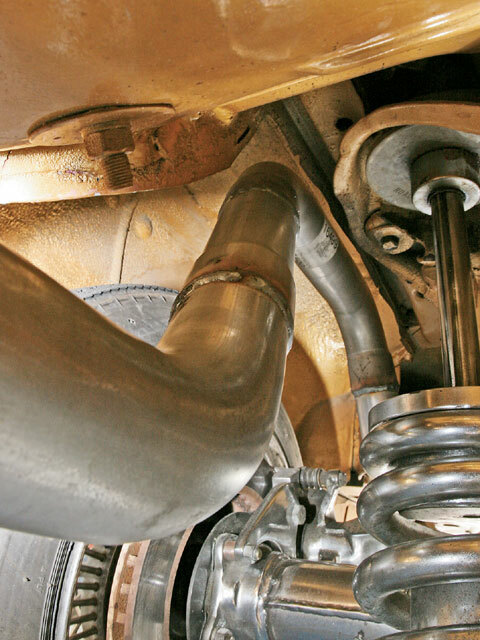 Another good reason to upgrade an exhaust system is to increase your gas mileage, as your engine tends to breathe a little bit better with a new exhaust. 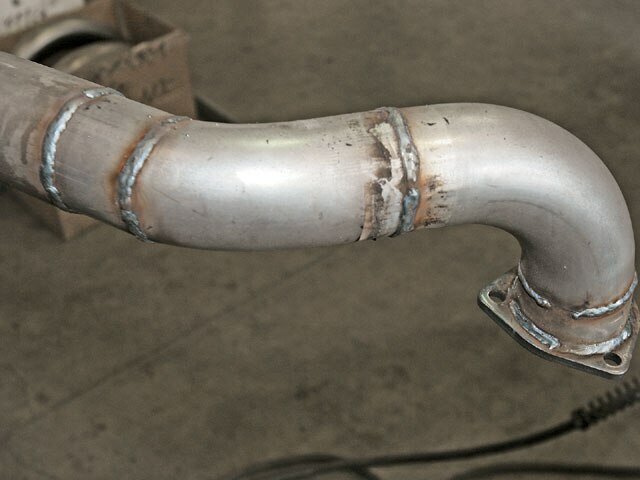 With gas prices reaching new highs this summer, that alone is a good reason to upgrade your exhaust. 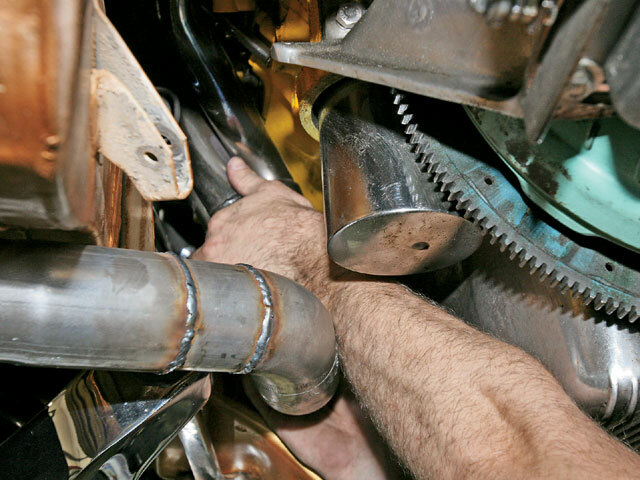 One more reason why guys change out their exhaust is to have that cool growling sound when driving. 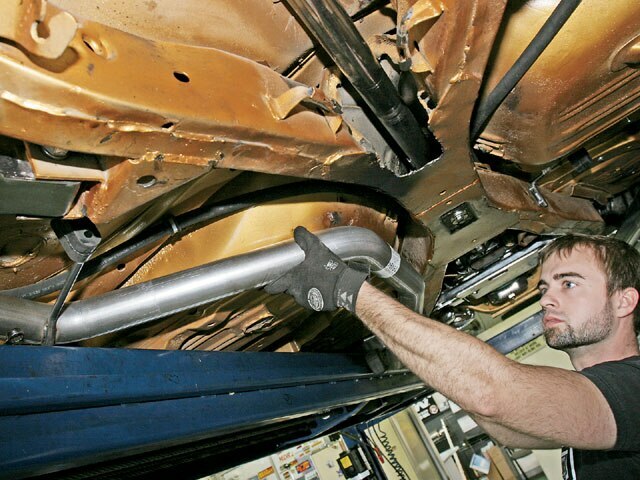 When it comes to exhaust systems, people tend to have different tastes. Most owners of classic bombs love the glass-packs. 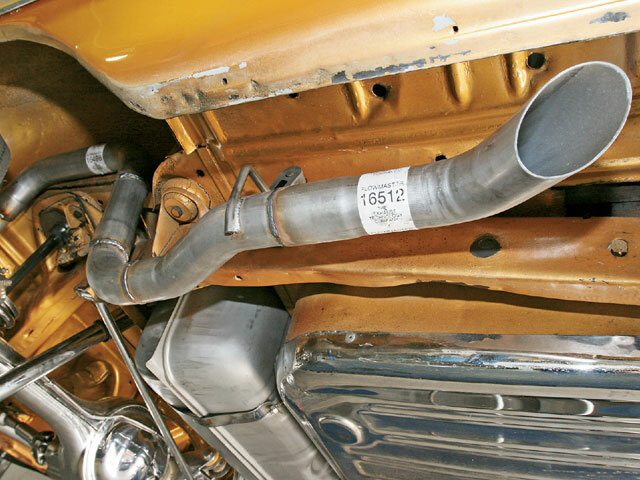 The guys with the classic Chevy Impalas like to go with the Flowmaster mufflers, so it was a natural that Flowmaster developed an exhaust kit for ’58-’64 Impalas. Rumor has it that they’re already working on the next generation of Impala kits, so watch out for those. 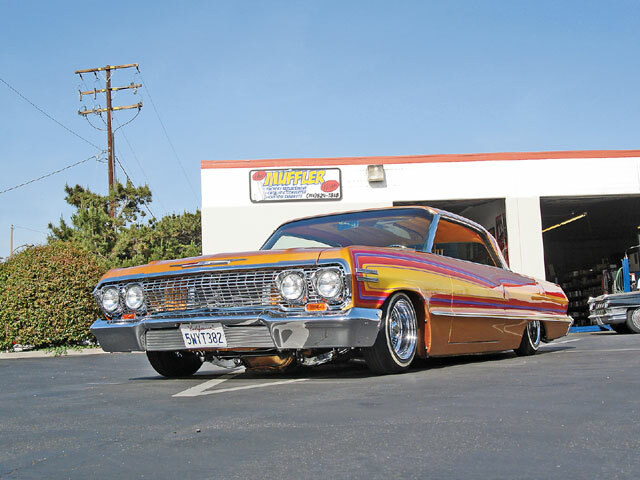 For this article, we caught up with The Muffler Man in Placentia, California, who was installing a Flowmaster mandrel-bent exhaust kit on a “first generation” Impala. 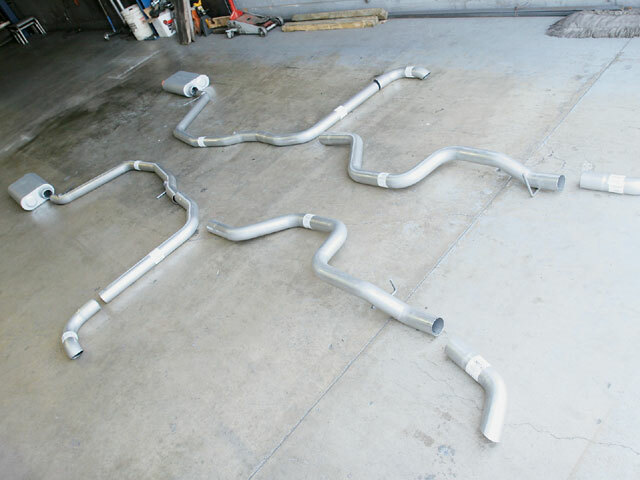 This kit was a long time in the making and comes with a few muffler choices, including a short version and a complete tube kit. 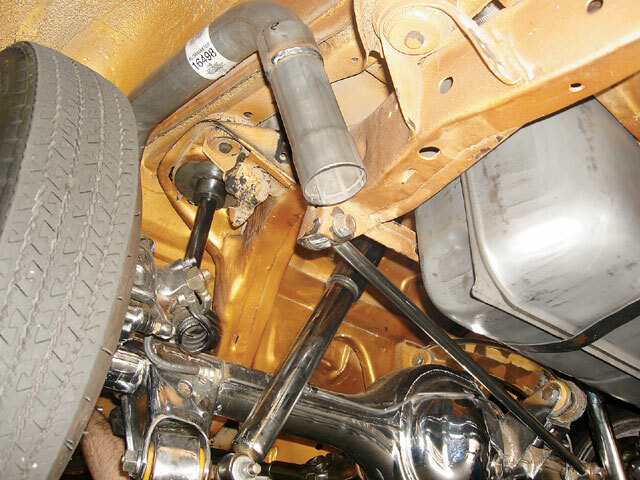 For this install, we opted to use a complete system with two Hush Power 2-inch mufflers. 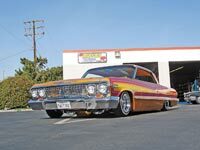 You’ve seen them advertised in Lowrider as the “Sound of Lowrider,” and Flowmaster has pretty much hit it on the dot with their all-steel mufflers and exhaust kits. 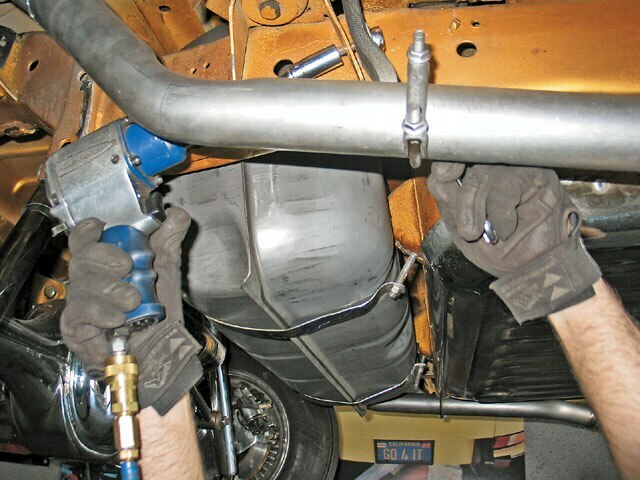 Now follow along as Josh of The Muffler Man installs this mandrel-bent Flowmaster exhaust kit on a classic ’63 Impala. This guy might as well have just put up caution flags instead of these long muffler tips. The new Flowmaster 2.5-inch exhaust kit is available in several combinations depending on your needs. 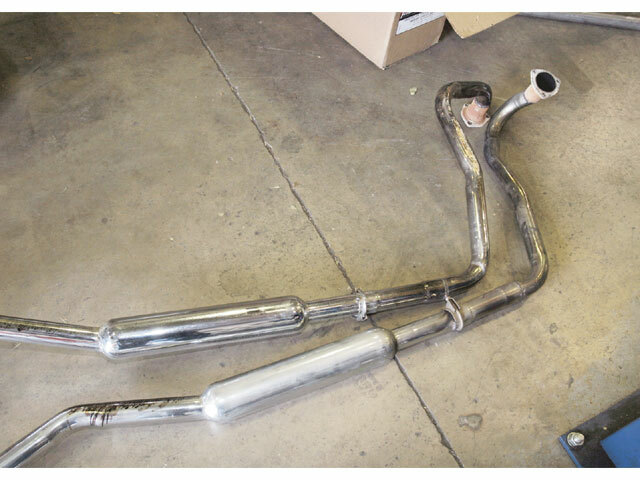 This version features the traditional three-chamber mufflers. This Impala was ready to get a modernized mandrel-bent exhaust. 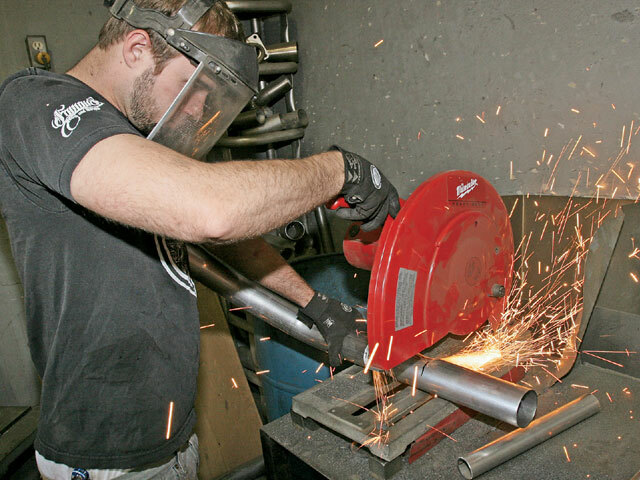 Josh started off by cutting the old exhaust with a Sawzall. These old school glass-packs are good for a classic bomb but have no business under this Impala. 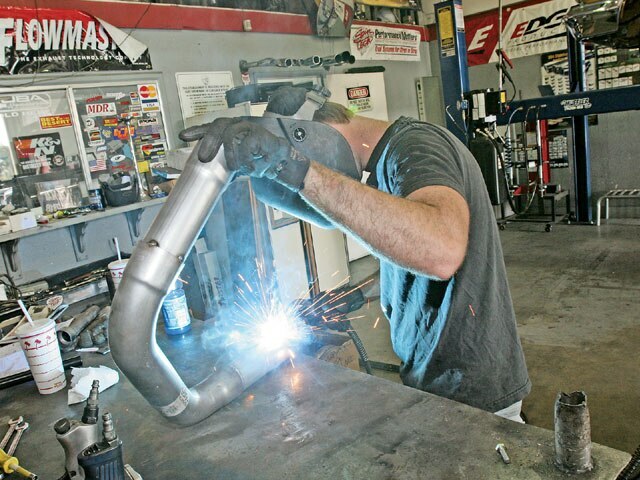 Josh started by placing the center of the exhaust into location and working his way forward before tackling the rear part of the kit. 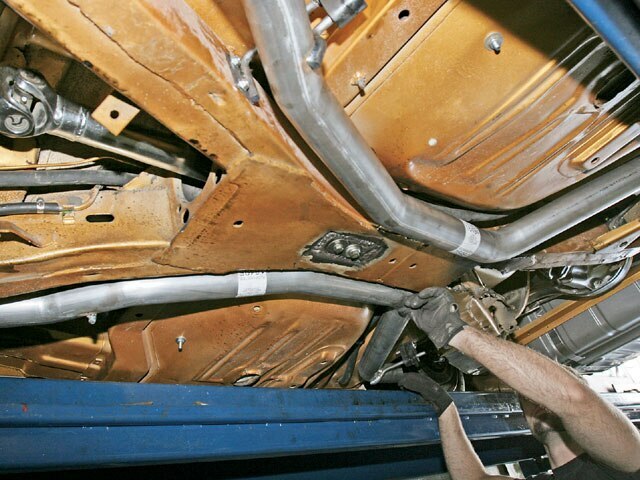 As you can see, these pipes do not hang below the frame and are great if your car lays low with hydraulics or airbags. The front part of the exhaust kit was test fit for adjustments that needed to be made. 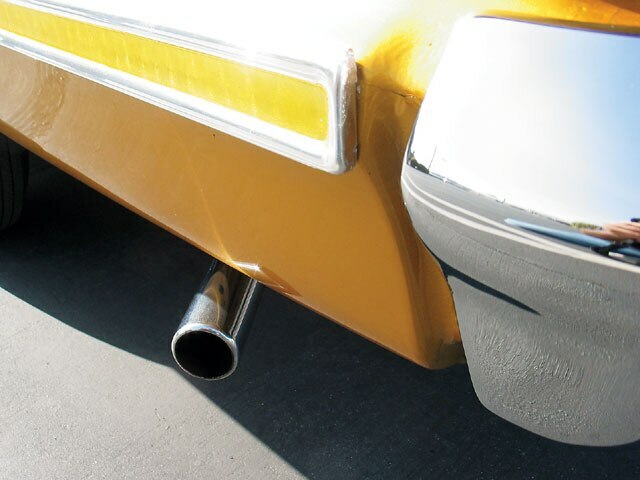 We used the optional exhaust tips that came with the kit as the drop-down connectors only need minor adjustments to make it work. 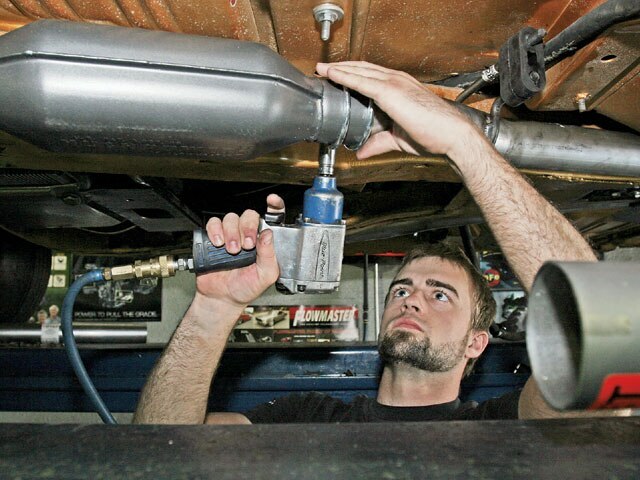 The headers were connected to the exhaust with an air impact tool. 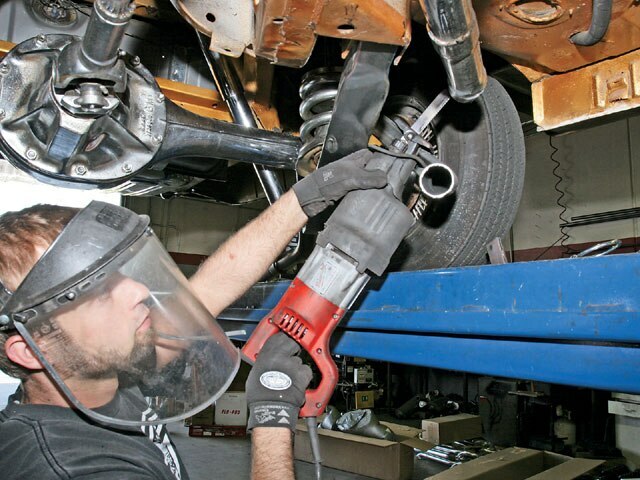 The exhaust kit comes with muffler hangers that were designed specifically for that vehicle. These pipes are going to be held in place with the provided hangers. 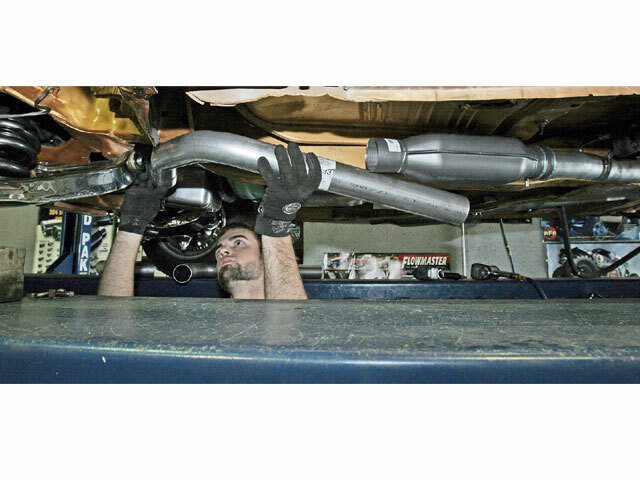 There are many Flowmaster mufflers to choose from. We opted to use their Hush Power mufflers. 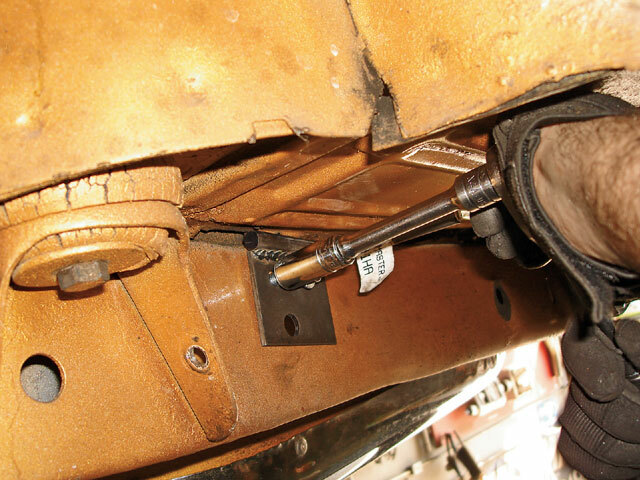 Josh tightened the Hush Power into place with the clamps provided with the kit. The drop-downs were almost perfect. 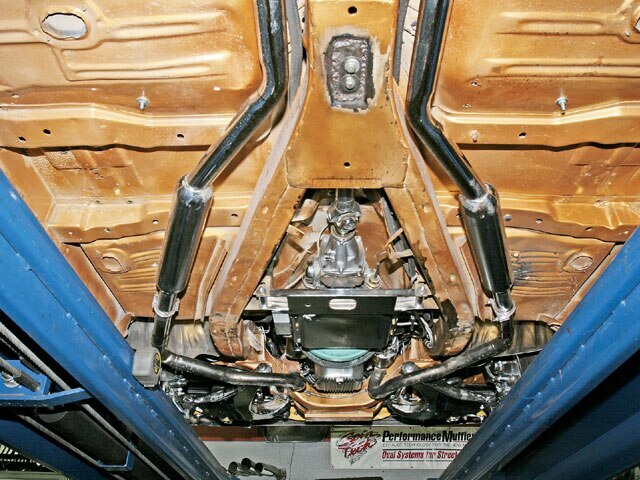 Even Flowmaster had no idea that they worked so well for our “block-hugger” headers. 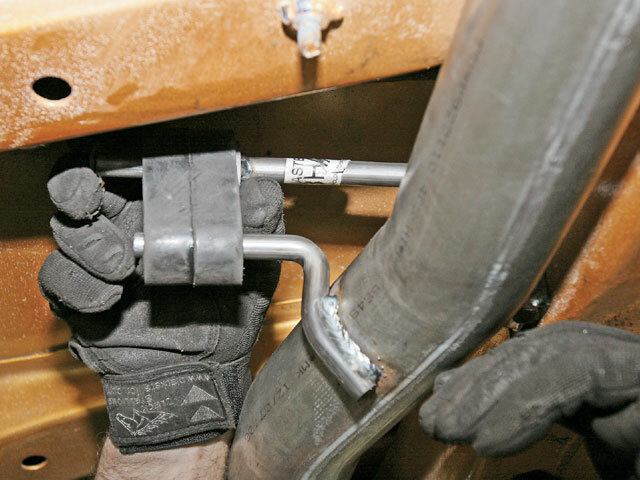 Here’s a look at a finished drop-down connector, which was also welded to the exhaust kit. The kit has six hangers that are used throughout the frame, including this one that goes on the rear. Josh used a chop saw to trim the pipe to size. The drop-down connector went on perfectly and was mocked into place. After mocking up the rear hump, we realized that it had to be modified to allow the car to lay all of the way without being held up on the exhaust. 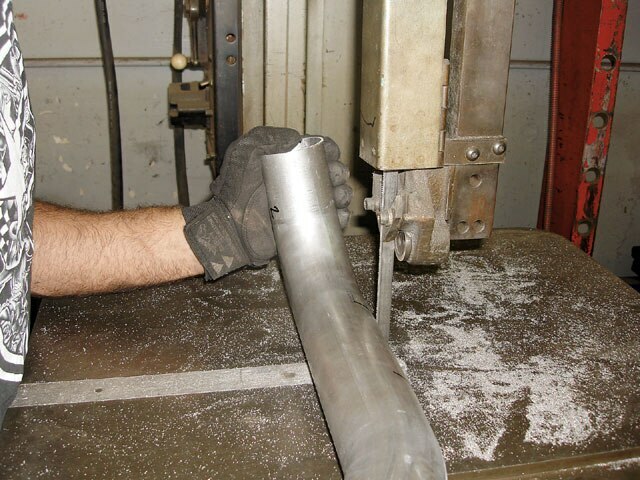 The hump pipe was stretched out 6 inches to allow the axle to go down all of the way without scraping when it’s down. 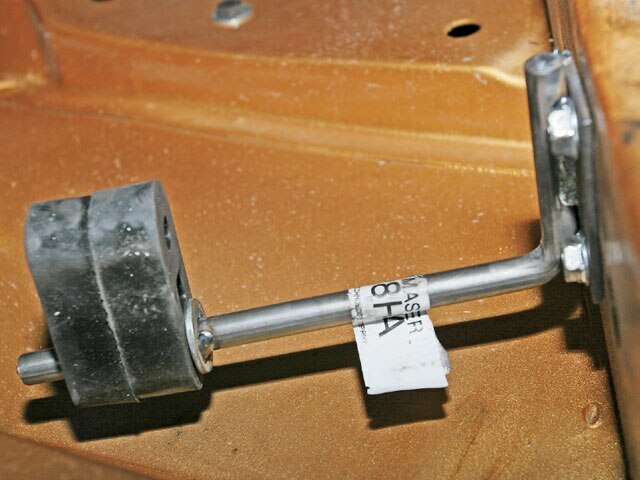 Here’s a look at all of the clearance that’s needed to allow this car to lay without the pipes getting caught up in the brake calipers. The rear tips were welded on and tucked so that they can’t be seen unless the car’s lifted. Here’s a look at the front part of the fully installed exhaust kit. Josh test fit the rear part of the exhaust kit. 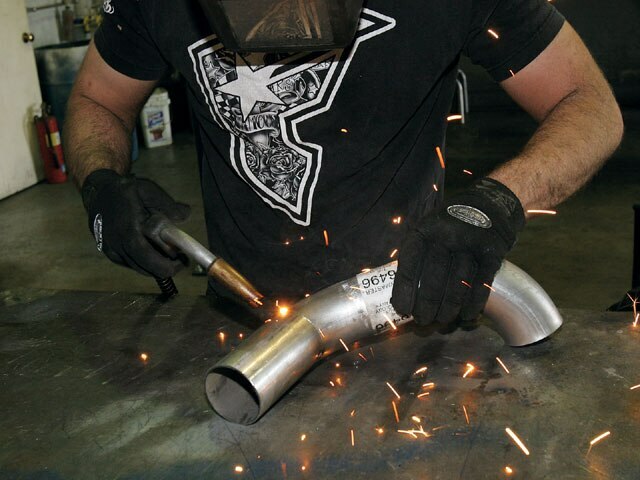 Once Josh knew what he needed, he welded the pipes together to ensure that there are no exhaust leaks. There are no more tips visible and the car has a sleeker look.